Objectives. To determine the sedative and respiratory effects of clonidine when used to evaluate growth hormone (GH) secretion in children with Prader Willi Syndrome (PWS). Methods. The study prospectively evaluated children with PWS who received clonidine (0.15 mg/ ) to assess GH responsiveness. Patients were studied up to four times over three years. Vital signs, oxygen saturation, and sedation level were recorded at baseline and every five minutes following clonidine. Changes between baseline and post-clonidine were evaluated using a repeated measurement analysis. Results. Sixty studies were performed on 17 patients, mean age months. The mean SD dose of clonidine was mg ( mcg/kg). All patients achieved a sedation score of 4 to 5 (drowsy to asleep). Mean declines in respiratory rate ( breaths/min; ), and oxygen saturation ( %; ) occurred following clonidine. Five patients (29%) experienced oxygen saturations 94% on nine occasions. Three oxygen desaturations were accompanied by partial airway obstruction. Conclusions. Clonidine doses to assess GH secretion often exceed doses used for sedation and result in significant respiratory depression in some children with PWS. There was no association between oxygen desaturation and BMI. Prader Willi Syndrome (PWS) is a complex genetic disorder associated with abnormalities of respiratory control [1–6]. Respiratory dysfunction contributes to significant morbidity and early mortality in this population [7–9]. Pulmonary problems include decreased respiratory muscle function and a propensity for upper airway obstruction due to pharyngeal hypotonia and narrowness [6, 8]. Abnormalities in respiratory function are particularly common during sleep and are characterized by impaired ventilatory and arousal responses to hypoxia and hypercapnia in both adult and pediatric patients with PWS . Sleep disordered breathing is one of the minor diagnostic criteria for PWS  and encompasses the entire spectrum of sleep-related disturbances from alveolar hypoventilation and hypoxemia to obstructive sleep apnea [11–13]. Clonidine is a central alpha2-adrenergic receptor agonist used as a provocative agent to assess growth hormone (GH) secretion but also has analgesic and sedative properties and is used as a preanesthetic medication in adults and children . Unlike most sedatives clonidine has minimal clinically significant respiratory depressant effects (decrease in oxygen saturation of ≤1%) in healthy adults when used at oral doses of 3 to 4  g/kg . Similarly, in healthy children no oxygen saturations <95% were observed at oral clonidine doses of 4  g/kg as a preanesthetic . However, studies specifically assessing respiratory drive demonstrate reductions in minute ventilation and carbon dioxide responsiveness in otherwise healthy subjects following clonidine administration [15, 17]. The respiratory depressant effects are more evident and even life threatening when large doses of clonidine are given, particularly in cases of clonidine overdose [17–21]. The aim of this study was to assess the respiratory and sedative effects of clonidine in children with PWS when used as a provocative test for GH stimulation. We hypothesized that PWS patients, a patient population with abnormalities in respiratory drive and increased tendencies toward airway obstruction, are at risk of developing clinical signs of respiratory depression defined as a reduction in oxygen saturation ≤94% and/or airway obstruction following a standard dose of clonidine to assess GH responsiveness. The study was part of a randomized, longitudinal investigation that evaluated changes in energy expenditure and body composition before and following growth hormone (GH) administration in young patients with PWS [22, 23]. As part of this study protocol, assessments of provoked endogenous GH secretion following clonidine were performed up to four times during the three-year period, yielding 60 studies in 17 subjects. The intra-assay coefficient variation is 4%per Nichols Institute Diagnostics, San Juan Capistrano, CA. The University of Wisconsin (UW) Health Sciences Center Institutional Review Board and the UW General Clinical Research Center (GCRC) approved the study. Informed written consent was obtained from parents or a legal guardian prior to study enrollment. Eligible subjects were children with PWS: (1) confirmed by high-resolution cytogenetics, fluorescent in situ hybridization and/or methylation studies, (2) between the ages of 4 and 37 months at the time of inclusion, and (3) naïve to GH therapy. All patients received a standard dose of oral clonidine, 0.15 mg/m2, as a provocative agent for GH secretion [24, 25] (Figure 1). The stimulated mean peak GH value 60–90minutes after clonidine was 9.1 ng/mL ± 4.5range . The mean IGF-1 value at that time was 35.1 ± 17.7 ng/dL (−2.5SD for age- and gender-matched normal range). 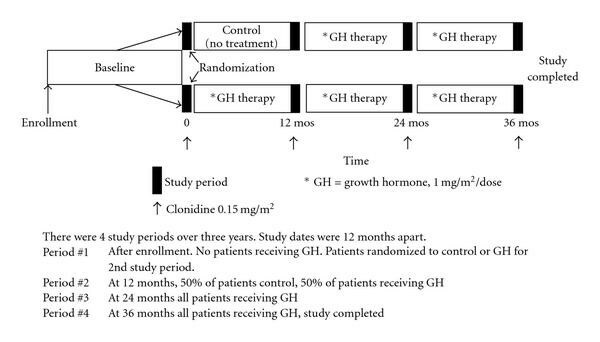 Following the first clonidine stimulation test, patients were stratified by gender and age (4 to 18 months and 19 to 37 months) and randomized to receive either GH treatment (Genotropin, Pfizer, 1 mg/m2/day) or observation for 12 months (control, no GH treatment). Consequently, half of the subjects were receiving GH during their second clonidine study. After the initial 12 month study period, all subjects received GH therapy for the duration of the study. During the time of clonidine provocative testing, patients were continuously monitored by pulse oximetry and constantly observed by a pediatric sedation study nurse for 2 hours following clonidine administration. Heart rate, respiratory rate, blood pressure, and oxygen saturation by pulse oximetry were recorded at baseline and every 5 minutes on a sedation monitoring record. Specific times were recorded for the onset of sleep and time to awakening. In addition, times were recorded for the lowest oxygen saturation, blood pressure, respiratory rate, and heart rate. A five-point pediatric sedation score was recorded every five minutes to assess the level of sedation: (1) agitated/clinging, (2) alert, awake, not clinging, may whimper but not cry, (3) calm, lying comfortably with eyes spontaneously open, (4) drowsy: lying comfortably with eyes spontaneously closed but responds to mild stimulation, and (5) asleep: eyes closed, does not respond to mild stimulation . The specific time when patients achieved a sedation level of 4 or 5 was recorded. Adverse events were defined as an oxygen saturation of ≤94%, airway obstruction requiring intervention, apnea and hypotension, or bradycardia requiring intervention. Interventions performed to treat adverse events were at the discretion of the monitoring nurse and recorded at that time. Vital signs and body composition parameters were summarized by standard descriptive statistics in terms of means and standard deviations. BMI z-scores were computed using the LMS method , based on the reference values from the 2006 World Health Organization growth charts. Changes between baseline and postclonidine administration assessments were evaluated using a repeated measurement model with subject specific random effects. In order to account for correlations between repeated measurements (visits 1–4) within the same subject, an autoregressive correlation structure was assumed. Vital sign parameters were log-transformed to perform the comparison between the baseline and postclonidine assessment. Standard model diagnostic tools were used to verify model assumptions. A paired -test was used to evaluate changes between the baseline and postclonidine assessment at each visit. 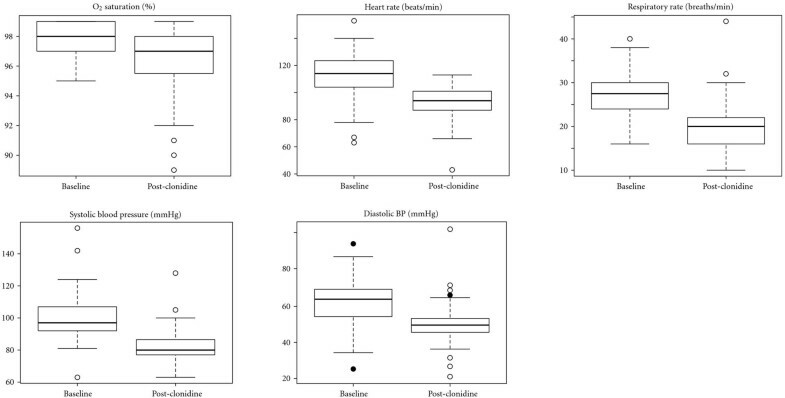 Box plots were used to present the results graphically because they illustrate important features such as outliers, spread, and departure from symmetry. The comparison of BMI z-score between subjects who achieved sufficient oxygen saturation to those who did not achieve sufficient oxygen saturation was performed using clustered -test (clustering on subject). All statistical tests were two sided, and P < .05 was used to indicate statistical significance. Statistical analyses were performed using SAS version 9.1 software (SAS Institute, Cary, NC). Seventeen patients were enrolled in the study, ten females and seven males. Of the 17 patients 11 had paternal deletion, five had uniparental maternal disomy, and one had DNA methylation abnormalities consistent with an imprinting center mutation. A total of sixty studies were conducted on the 17 patients. All 17 patients were studied at least once, 16 patients twice, 15 patients three times, and 12 patients four times. The overall mean age at the time of clonidine testing was 30.4 ± 15.0 months (Table 1). The mean age for the first study was 14.0 ± 6.8 months, for the second study 26.1 ± 7.2 months, for the third study 37.6 ± 6.9 months, and for the fourth study 50.2 ± 7.5 months. A total of 60 study periods were conducted over a 3-year period. Each study period was approximately 12 months apart. Seventeen patients were initially enrolled in the study. Twelve patients completed all four study periods. Overall refers to the mean age and clonidine dose for all 60 study periods. All patients achieved a sedation score of 4 or 5 following clonidine, consistent with a mild to moderate level of sleep. The mean time from clonidine administration to the onset of sleep was 34.3 ± 12.3 minutes. Overall, the mean decline from baseline in heart rate was 19.3 ± 14.6 beats/min (P < .001), respiratory rate 7.5 ± 6.1 breaths/min (P < .001), systolic blood pressure 19.7 ± 14.6 mmHg (P < .001), and diastolic blood pressure 12.8 ±16.6 (P = .006) (Figure 2). The baseline mean oxygen saturation was 98.4 ± 1.3% before clonidine. All patients had oxygen saturations ≥95% at the beginning of each study period. Oxygen saturations decreased from baseline by 2.2% ± 2.0% (P < .001) following clonidine. Absolute and percentage changes in individual vital signs for each of the four study periods are tabulated in Tables 2 and 3, respectively. Absolute changes of individual vital sign parameters following clonidine administration for each study period and overall. -value was calculated using a paired -test for study periods 1–4; a repeated measurement model with autoregressive correlation structure was used to compute -value for overall comparison. Percentage changes of individual vital sign parameters following clonidine administration for each study period and overall. Changes in oxygen saturation, heart rate, respiratory rate, systolic blood pressure, and diastolic blood pressure following clonidine treatment. Mean decrease in oxygen saturation was 2.2 ± 2.0 (P < .001), heart rate 19.3 ± 14.6 (P < .001), respiratory rate 7.5 ± 6.1 (P < .001), systolic blood pressure 19.7 ± 14.6 (P < .001) and diastolic blood pressure 12.8 ± 16.6 (P = .006). Box plots for the distributions of oxygen saturation, heart rate, respiratory rate, systolic blood pressure and diastolic blood pressure at baseline and post treatment. The horizontal bold line shows the median while the box represents the 25th and 75th percentiles. Nine oxygen desaturation events (oxygen saturation ≤94%) occurred during the 60 study periods (Table 4). The nine oxygen desaturations occurred in five patients, four patients having an oxygen desaturation during two separate study periods and one patient having one oxygen desaturation. All patients experiencing an oxygen desaturation event were female. The mean BMI z-score in patients with an oxygen desaturation event was 1.74 ± 2.30 while the mean BMI z-score in all other subjects was 0.93 ± 1.58. However, there was no significant association between the occurrence of an oxygen desaturation event and BMI z-score (P = .438). Seven of the nine oxygen desaturations occurred during either the second or third study. Four of the five patients had oxygen desaturations during the second study period, two of whom were receiving GH. Three episodes of oxygen desaturation were accompanied by mild to moderate airway obstruction and sonorous respirations, two of which were associated with an upper respiratory tract infection. One patient was described as having irregular respirations. All other oxygen desaturation episodes were accompanied by shallow respirations. No child required intervention above simple airway repositioning. Oxygen saturation levels returned to baseline once the patient was awake following the sedation and prior to discharge. No interventions were required for blood pressure or heart rate. PWS patients experiencing an oxygen desaturation. Characteristics of the 5 patients experiencing an oxygen desaturation on 9 separate occasions. BMI Z-scores were computed with the LMS method using WHO reference values for gender and age. This study demonstrates that clonidine administration at doses which are standard for provocative GH testing is associated with respiratory depression defined as an oxygen saturation ≤94% and/or clinical signs of airway obstruction (e.g., sonorous respirations) in children with PWS. Clonidine consistently resulted in a reliable and moderate depth of sedation that was accompanied by small reductions in heart rate, respiratory rate, systolic blood pressure, and oxygen saturation. Five patients, on nine separate occasions, developed moderate reductions in oxygen saturation following clonidine administration. To our knowledge this is the first report to demonstrate respiratory depression in patients with PWS following a standard dose of clonidine used to assess GH secretion response. Collapsibility of the upper airway due to a depressed level of consciousness and loss of pharyngeal muscle tone is one of the most serious complications following sedative-anesthetic drug administration [28–30]. In this regard, clonidine is a sedative used in anesthetic practice and has potential to cause problems with upper airway tone. It is likely that respiratory control dysfunction in PWS patients, the respiratory depressant effects of clonidine, and the relatively high doses used to assess GH secretion create a heightened risk for respiratory depression in these children. Numerous studies have demonstrated abnormal sleep patterns in patients with PWS that include hypoventilation, oxygen desaturation and sleep apnea [11–13, 31–36]. In addition to ventilation control abnormalities, children with PWS have additional risk factors that predispose them to abnormal pulmonary function and respiratory responsiveness. Hypotonia, obesity, and reduced muscle mass contribute to overall respiratory pump weakness and a restrictive lung pattern in patients with PWS . While none of our PWS patients were obese, abnormalities in body composition are already present during infancy , including reduced muscle mass, which may have contributed to the overall reduction in airway tone and ventilatory response following clonidine. Recent reports of sudden death in children with PWS receiving GH supplementation have focused attention on the underlying respiratory disturbances in PWS. Our study was not designed to assess the effects of GH treatment on respiratory function on patients with PWS. Studies have demonstrated that pulmonary dysfunction directly contributes to mortality in the majority of PWS whether or not they are receiving GH [7–9]. Indeed, in a multicenter randomized controlled study no significant changes in sleep-related apneas or hypopneas were seen in young PWS patients receiving GH treatment . Tauber et al. found that 61% of sudden deaths in children with PWS were directly attributed to a respiratory problem . An upper respiratory infection was present in four of the nine episodes of oxygen desaturation in our study. An intrinsic abnormality of respiratory drive in children with PWS could be exacerbated by the respiratory depressant effects of clonidine. Clonidine has few clinically significant respiratory depressant effects when used at doses of 3 to 4  g/kg [14, 16, 39–46]. In otherwise healthy adults declines in oxygen saturation were ≤1% following oral clonidine . Similarly, no oxygen saturations <95% were observed in children receiving 4  g/kg of oral clonidine as a preanesthetic medication . In fact, clonidine is considered so safe in this setting that few studies even discuss monitoring oxygen saturations following administration. Indeed only one study, adult patients without PWS, has demonstrated decreases in oxygen saturation that were accompanied by partial airway obstruction following clonidine as a preanesthetic medication . Of the nine oxygen desaturations in the children with PWS in our study, four were associated with partial airway obstruction. The standard dose of clonidine to assess GH responsiveness is 0.15 mg/m2 [24, 25]. Interestingly, this dosing, based on surface area, resulted in a mean clonidine dose of 6.56  g/kg during the first study and 5.3  g/kg for all studies overall. Consequently clonidine doses were 1.5 to 2 times greater than typical doses used as a preanesthetic medication. To our knowledge use of pulse oximetry to assess respiratory function following clonidine for GH stimulation has not been studied. Yet, doses of clonidine for GH stimulation often exceed amounts identified in unintentional ingestions as potentially toxic . In a recent study examining clonidine ingestions in children, Spiller et al., recommended direct medical evaluation of all children 4 years of age and younger for clonidine ingestions of 0.1 mg and/or 5  g/kg or greater. Interestingly, of the 60 clonidine administrations in our study the average dose of clonidine exceeded 5  g/kg and 42 (70%) doses of clonidine were equal to or exceeded 0.1 mg or 5  g/kg. In patients experiencing low oxygen saturation five of the nine (55%) administrations exceeded 5  g/kg. While our setting and patient population is different than that described by Spiller et al., the recognition that doses of this amount have potential for serious adverse events in children is consistent with our findings in patients with PWS. A limitation to our study was that it did not have the rigor of a blinded randomized controlled investigation. The lack of an alternative-treatment control group prevented us from being able to discern whether clonidine administration per se caused these respiratory abnormalities or was merely associated with them. We chose this design in order to assess a standard assessment tool. A randomized, placebo, controlled study will be necessary to clarify the respiratory effects of clonidine. Secondly, detailed baseline sleep study information was not available for all patients. Since PWS patients often have sleep disordered breathing, the oxygen desaturation events in our 5 patients may simply represent what typically occurs in these patients during sleep. In addition, four oxygen desaturation episodes were in the presence of an upper respiratory tract infection. The presence of an upper respiratory infection may have exacerbated the respiratory dysfunction in this patient population following clonidine administration. Whether clonidine simply simulates what happens during normal sleep in PWS patients or accentuates an underlying respiratory control problem is unclear. We used a definition of an oxygen desaturation of less than or equal to 94% as an adverse event. We chose to have a low threshold for reporting an oxygen desaturation in an effort to increase the sensitivity for detecting respiratory depression in our patient population. Our definition of an oxygen desaturation is similar to that used in other studies evaluating the safety of clonidine . In conclusion, while the majority of patients with PWS developed only minimal respiratory changes following clonidine administration, a subset of patients experienced reductions in oxygen saturation that were accompanied by partial airway obstruction or shallow respirations. Further, clonidine doses used for GH stimulation in children are substantially greater than doses routinely used for sedation and in our patient population resulted in a moderate depth of sedation. The American Academy of Pediatrics recommends continuous monitoring of oxygen saturation and heart rate for all patients receiving moderate sedation . In our study all patients achieved a sedation level of 4 (drowsy, responds to mild stimulation) or 5 (asleep, does not respond to mild stimulation), following clonidine administration. This degree of sedation is consistent with the definition of moderate to deep sedation. Because of the large doses of clonidine used for GH stimulation and the intrinsic respiratory dysfunction in children with PWS we would recommend that all PWS patients receiving clonidine for GH stimulation receive continuous monitoring by pulse oximetry and be cared for by personnel proficient in the monitoring and management of the sedated pediatric patient. Further prospective studies are required to assess the risk of clonidine use in patients with PWS.